Turkish rabbinical author; born at Smyrna in 1809; died there 1899; son of Ḥayyim Palaggi. On the death of his father (1869), Abraham succeeded him as chief rabbi of Smyrna in virtue of an imperial decree; and he held this position for thirty years until his own death, repeatedly defending his coreligionists against the charge of ritual murder. Palaggi was the author of sixteen works in Hebrew and one in Judæo-Spanish, each containing in its title the author's name, Abraham. The list is as follows: "Shema' Abraham" (Salonica, 1850), responsa; "Berak et-Abraham" (ib. 1857), sermons; "Shemo Abraham," vol. i., ethics (ib. 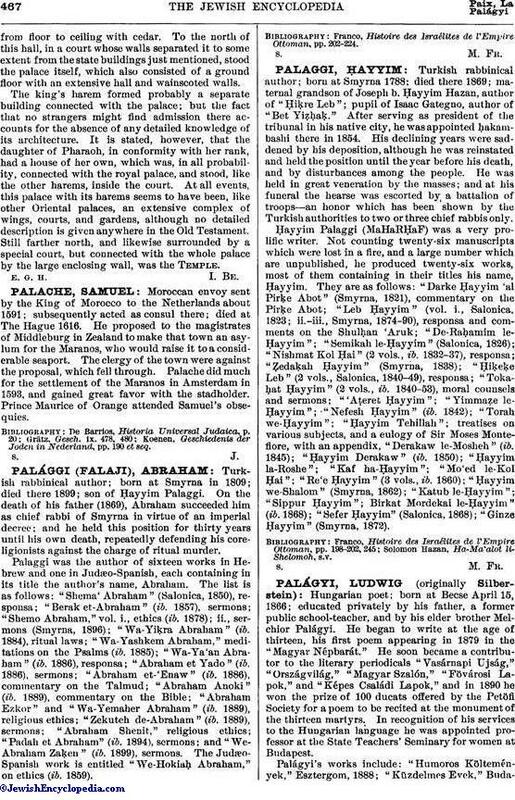 1878); ii., sermons (Smyrna, 1896); "Wa-Yiḳra Abraham" (ib. 1884), ritual laws; "Wa-Yashkem Abraham," meditations on the Psalms (ib. 1885); "Wa-Ya'an Abraham" (ib. 1886), responsa; "Abraham et Yado" (ib. 1886), sermons; "Abraham et-'Enaw" (ib. 1886), commentary on the Talmud; "Abraham Anoki" (ib. 1889), commentary on the Bible; "Abraham Ezkor" and "Wa-Yemaher Abraham" (ib. 1889), religious ethics; "Zekuteh de-Abraham" (ib. 1889), sermons; "Abraham Shenit," religious ethics; "Padah et Abraham" (ib. 1894), sermons; and "We-Abraham Zaḳen" (ib. 1899), sermons. The Judæo-Spanish work is entitled "We-Hokiaḥ Abraham," on ethics (ib. 1859). Franco, Histoire des Israélites de l'Empire Ottoman, pp. 202-224.